Maritim is number one for customer satisfaction: The hotel group is the industry winner in the premium hotels category and came top of the 179 highest-placed companies across all industries. 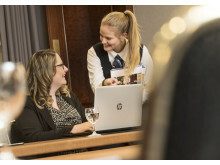 Maritim Hotels, Germany, has been recognised as the leading company for customer satisfaction in a survey of over 800,000 customers that rated 2,200 companies across a range of sectors. 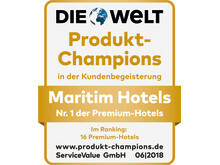 Maritim Hotels not only claimed the highest overall ranking of all the companies involved but was also placed first among a total of 16 international and national hotel chains in the premium hotels category. The recent large-scale survey was conducted by the German newspaper Die Welt and the service quality and relationship management company Service Value GmbH. Rankings are based on the Product Benefit Score (PBS). The PBS is derived from the percentage of respondents who are impressed by the product. With a PBS of 76.3 percent, Maritim secured the top spot among the 179 highest placed companies, greatly exceeding the industry-wide average of 69.1 percent for the 16 premium hotels as a whole. “We are rightly proud of this fantastic achievement: Maritim Hotels will celebrate its 50th anniversary next year. 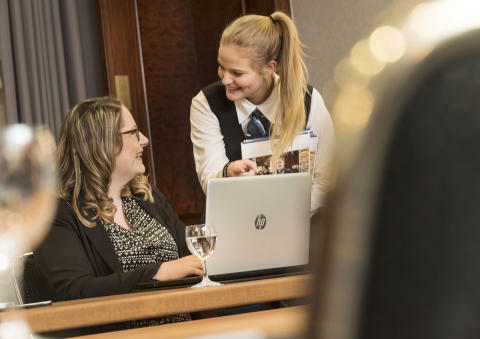 High-quality, customer-focused service and high-quality training for new entrants to the hotel industry have been part of Maritim’s DNA from the very start. We are also investing heavily in our hotel renovation programme. By naming us number one for customer satisfaction, it is clear that our guests greatly appreciate this aspect of our service. That is why we are particularly delighted by this accolade,” summarises Roland Elter, Chief Commercial Officer at Maritim Hotels. Just last year, Maritim was voted the industry’s most trusted brand and recognised as one of the top companies in Germany for vocational training and for the highest quality service.